VEI redirects here. For the company, see Visual Entertainment Inc. The Volcanic Explosivity Index (VEI) is a relative measure of the explosiveness of volcanic eruptions. It was devised by Chris Newhall of the United States Geological Survey and Stephen Self at the University of Hawaii in 1982. Volume of products, eruption cloud height, and qualitative observations (using terms ranging from "gentle" to "mega-colossal") are used to determine the explosivity value. The scale is open-ended with the largest volcanoes in history given magnitude 8. A value of 0 is given for non-explosive eruptions, defined as less than 10,000 m3 (350,000 cu ft) of tephra ejected; and 8 representing a mega-colossal explosive eruption that can eject 7012100000000000000♠1.0×1012 m3 (240 cubic miles) of tephra and have a cloud column height of over 20 km (66,000 ft). 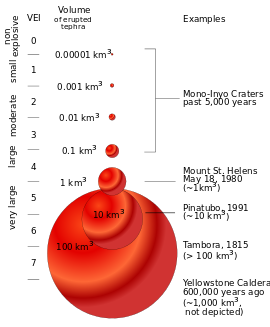 The scale is logarithmic, with each interval on the scale representing a tenfold increase in observed ejecta criteria, with the exception of between VEI-0, VEI-1 and VEI-2. With indices running from 0 to 8, the VEI associated with an eruption is dependent on how much volcanic material is thrown out, to what height, and how long the eruption lasts. The scale is logarithmic from VEI-2 and up; an increase of 1 index indicates an eruption that is 10 times as powerful. As such there is a discontinuity in the definition of the VEI between indices 1 and 2. The lower border of the volume of ejecta jumps by a factor of one hundred, from 10,000 to 1,000,000 m3 (350,000 to 35,310,000 cu ft), while the factor is ten between all higher indices. In the following table, the frequency of each VEI indicates the approximate frequency of new eruptions of that VEI or higher. About 40 eruptions of VEI-8 magnitude within the last 132 million years (Mya) have been identified, of which 30 occurred in the past 36 million years. Considering the estimated frequency is > 50,000 years, there are likely many such eruptions in the last 132 Mya that are not yet known. Based on incomplete statistics, other authors assume that at least 60 VEI-8 eruptions have been identified. The most recent is Lake Taupo's Oruanui eruption, more than 27,000 years ago, which means that there have not been any Holocene eruptions with a VEI of 8. 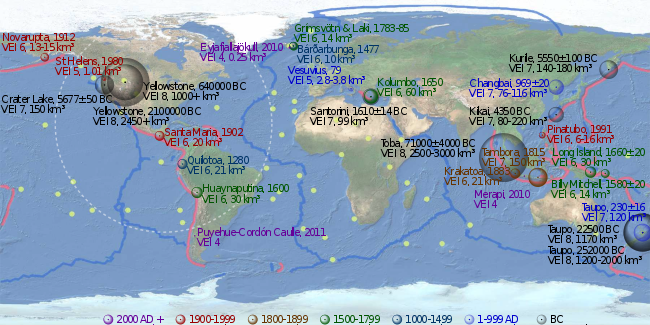 There have been at least 10 eruptions of VEI-7 in the last 10,000 years. There are also 58 plinian eruptions, and 13 caldera-forming eruptions, of large, but unknown magnitudes. By 2010, the Global Volcanism Program of the Smithsonian Institution had catalogued the assignment of a VEI for 7,742 volcanic eruptions that occurred during the Holocene (the last 11,700 years) which account for about 75% of the total known eruptions during the Holocene. Of these 7,742 eruptions, about 49% have a VEI of ≤ 2, and 90% have a VEI ≤ 3. Under the VEI, ash, lava, lava bombs, and ignimbrite are all treated alike. Density and vesicularity (gas bubbling) of the volcanic products in question is not taken into account. In contrast, the DRE (dense-rock equivalent) is sometimes calculated to give the actual amount of magma erupted. Another weakness of the VEI is that it does not take into account the power output of an eruption, which makes the VEI extremely difficult to determine with prehistoric or unobserved eruptions. Although VEI is quite suitable for classifying the explosive magnitude of eruptions, the index is not as significant as sulphur dioxide emissions in quantifying their atmospheric and climatic impact, as a 2004 paper by Georgina Miles, Roy Grainger and Eleanor Highwood points out. "Tephra, or fallout sediment analysis, can provide an estimate of the explosiveness of a known eruption event. It is, however, not obviously related to the amount of SO2 emitted by the eruption. The Volcanic Explosivity Index (VEI) was derived to catalogue the explosive magnitude of historical eruptions, based on the order of magnitude of erupted mass, and gives a general indication as to the height the eruptive column reached. The VEI itself is inadequate for describing the atmospheric effects of volcanic eruptions. This is clearly demonstrated by two eruptions, Agung (1963) and El Chichón (1982). Their VEI classification separates them by an order of magnitude in explosivity, although the volume of SO2 released into the stratosphere by each was measured to be broadly similar, as shown by the optical depth data for the two eruptions." Clickable imagemap of notable volcanic eruptions. The apparent volume of each bubble is linearly proportional to the volume of tephra ejected, colour-coded by time of eruption as in the legend. Pink lines denote convergent boundaries, blue lines denote divergent boundaries and yellow spots denote hotspots. ^ Newhall, Christopher G.; Self, Stephen (1982). "The Volcanic Explosivity Index (VEI): An Estimate of Explosive Magnitude for Historical Volcanism" (PDF). Journal of Geophysical Research. 87 (C2): 1231–1238. Bibcode:1982JGR....87.1231N. doi:10.1029/JC087iC02p01231. Archived from the original (PDF) on December 13, 2013. ^ "Volcanic Explosivity Index (VEI)". Global Volcanism Program. Smithsonian National Museum of Natural History. Archived from the original on November 10, 2011. Retrieved August 21, 2014. ^ "Global Volcanism Program - Hoodoo Mountain". volcano.si.edu. ^ a b Dosseto, A. (2011). Turner, S. P.; Van-Orman, J. A. (eds.). Timescales of Magmatic Processes: From Core to Atmosphere. Wiley-Blackwell. ISBN 978-1-4443-3260-5. ^ Froggatt, P. C.; Nelson, C. S.; Carter, L.; Griggs, G.; Black, K. P. (13 February 1986). "An exceptionally large late Quaternary eruption from New Zealand". Nature. 319 (6054): 578–582. Bibcode:1986Natur.319..578F. doi:10.1038/319578a0. Retrieved 23 August 2010. ^ Bryan, S.E. (2010). "The largest volcanic eruptions on Earth". Earth-Science Reviews. 102 (3–4): 207–229. Bibcode:2010ESRv..102..207B. doi:10.1016/j.earscirev.2010.07.001. ^ Mason, Ben G.; Pyle, David M.; Oppenheimer, Clive (2004). "The size and frequency of the largest explosive eruptions on Earth". Bulletin of Volcanology. 66 (8): 735–748. Bibcode:2004BVol...66..735M. doi:10.1007/s00445-004-0355-9. ^ Siebert, L.; Simkin, T.; Kimberly, P. (2010). Volcanoes of the World (3rd ed.). University of California Press. pp. 28–38. ISBN 978-0-520-26877-7. ^ Miles, M. G.; Grainger, R. G.; Highwood, E. J. (2004). "Volcanic Aerosols: The significance of volcanic eruption strength and frequency for climate" (PDF). Quarterly Journal of the Royal Meteorological Society. 130 (602): 2361–2376. doi:10.1256/qj.30.60 (inactive 2019-03-16).